On Friday January 19, 2018 a retirement reception was held in honor of Sergeant Ed Lackey in the Sheriff’s Office conference room where he was surrounded by his friends, family, and coworkers. Sergeant Lackey began his career in law enforcement with the Paulding County Sheriff’s Office on May 31, 1988 and officially retired on December 18, 2017. When he began his career with the Sheriff’s Office, Sergeant Lackey started out as a Jailer in the Detention Center. After a short time in the Detention Center he was transferred to the Patrol Division where he became a P.O.S.T. certified Deputy. 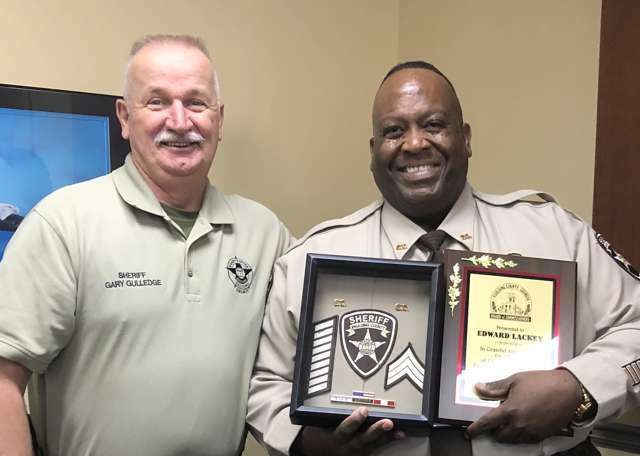 Sergeant Lackey quickly became proficient as a patrol Deputy and was tasked as one of the first two DUI Task Force Deputies at the Paulding County Sheriff’s Office. Sergeant Lackey was later promoted to Sergeant and eventually transferred to the Warrants/Civil Division where he spent the majority of his career. Sergeant Lackey began on the Warrants side of the division, but eventually transferred over to the Civil side. Sergeant Lackey is considered by his peers to be one of the most knowledgeable Deputies on Civil Process at the Sheriff’s Office. Throughout his career he has served thousands of Writ of Possessions, Fiera Facias, Subpoenas, and various other civil papers. Sergeant Lackey will be missed by his coworkers and the citizens he encountered every day. Sergeant Lackey’s law enforcement career has spanned over 29 years. During his tenure as a law enforcement officer, he has seen many changes in the profession. We want to wish Sergeant Lackey a happy and relaxing retirement. Now he will have plenty of time to enjoy life and spend time with his family. I started my job just a few weeks before him on March 19, 1988, but I have quite a few years to go before I can retire.